This next recipe is inspired by a slice of pie that I had while Andrew and I were on our road trip through West Texas. The Bourbon Pecan Pie was so good at Blue Mountain Bistro in Fort Davis that I came back the next day for brunch, hoping to talk the chef into giving me the recipe. I did meet the chef, whose name also happens to be Connie (what are the odds? ), and she was a delight to talk to. In the end, I didn’t leave with the recipe in my hand, but that didn’t discourage me from trying to make the pie when I got home. While the pie was a memorable part of the trip, we also saw some great sites along the way. 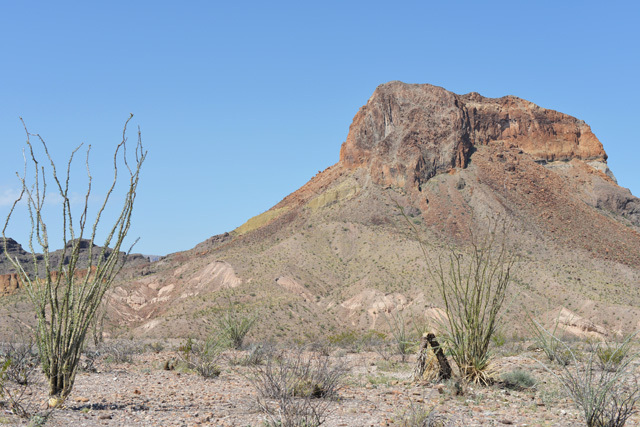 Big Bend National Park was the first big site that we visited. It’s one of those places, like the Grand Canyon, where none of your pictures can really do it justice. We also stopped in a lot of small towns. 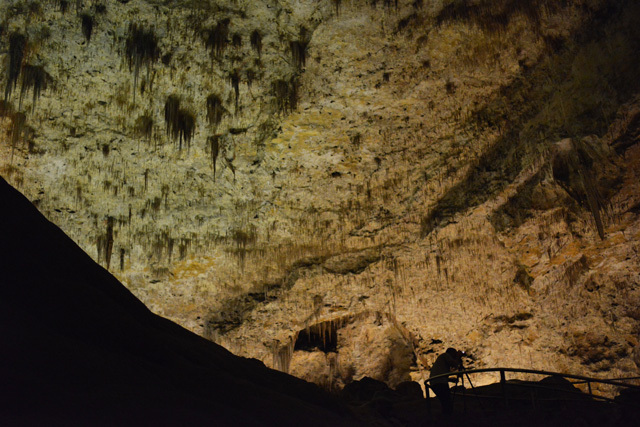 We ate schnitzel in Fredericksburg, endured an electricity outage in Marathon, attempted to see the mysterious Marfa lights, and stargazed at an amazing observatory near Fort Davis. 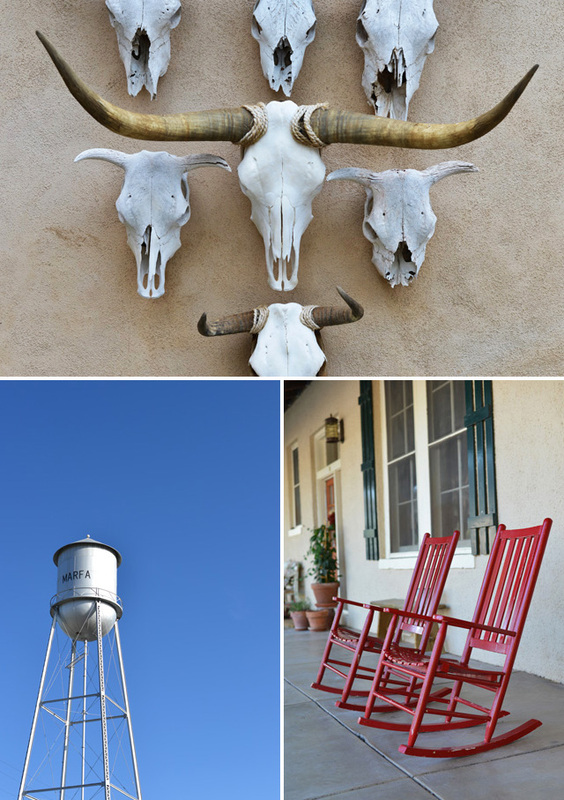 Pictured above are skulls in Marathon, the Marfa water tower, and rocking chairs in Fort Davis. The last big destination of the trip was White Sands in New Mexico. We watched the sunset from the dunes the night we drove in and then spent the next morning taking pictures and trying not to get lost as we hiked through the sands. On our way back home to Houston, we stopped in Austin, where we hunted for antiques, ate some great food, and fell in love with the Hotel San Jose (pictured above right). As with the last time I went to Austin, I left wishing that I lived there. Pretty much after every trip that Andrew and I take, we say, “that was one of our best trips,” but really… that was one of our best trips. We are always planning big trips abroad and this road trip reminded us of how much there is to see and do in the good ole’ USA. Plus, the trip inspired me to make this pie and that alone was worth a week on the road. I don’t mean to brag, but this is probably one of the best pies I have ever made. I’m pretty sure that Andrew fell in love with me all over again when I gave him a slice. I think using good bourbon is the key. Its scent permeates the filling and adds a wonderful depth to the pie’s flavor, so use the good stuff. Also, this pecan pie happens to be corn syrup-free, so you don’t have to buy a bottle of that heavily processed stuff—regular brown sugar and cane sugar work just fine. I can’t say how my pie stacks up with the one I had in Fort Davis, or how similar or dissimilar the recipes are, but I can say that both pies are pretty darn good. Heat the oven to 400 degrees. On a lightly floured surface, roll out the Pâte Brisée dough until it is about 1/8-inch thick. Lay it over a 9-inch pie plate and gently fit the dough into the plate without pulling or stretching the dough. Trim the edges of the dough so that there is a 1-inch overhang and then tuck the overhang under itself so that the edge of the piecrust meets the edge of the pie plate. Crimp the edges however you like. Then prick the bottom of the piecrust all over with a fork. Chill the prepared piecrust in the fridge or the freezer until firm. In a large bowl, beat the eggs with a whisk or a hand mixer until foamy and then stir in the melted butter. Add the brown sugar, sugar, flour, and salt and stir until combined. Then stir in the bourbon, milk, vanilla, and pecans, until everything is well mixed. Place the unbaked piecrust on a parchment paper lined rimmed baking sheet and pour the filling into the piecrust. Bake at 400 degrees for 10 minutes, and then reduce the oven temperature to 350 degrees, and bake for an additional 30 to 45 minutes, until the filling is set, but jiggles a tiny bit when the pie is moved. Keep an eye on how brown your crust gets while baking. Once it gets to the color you want, cover the edges with a pie ring or aluminum foil while the filling continues to bake. Once baked, transfer the pie to a wire rack to cool. Serve warm, at room temperature, or cold—however you like your pecan pie. It’s delicious no matter how you serve it. Store any leftovers in the fridge. 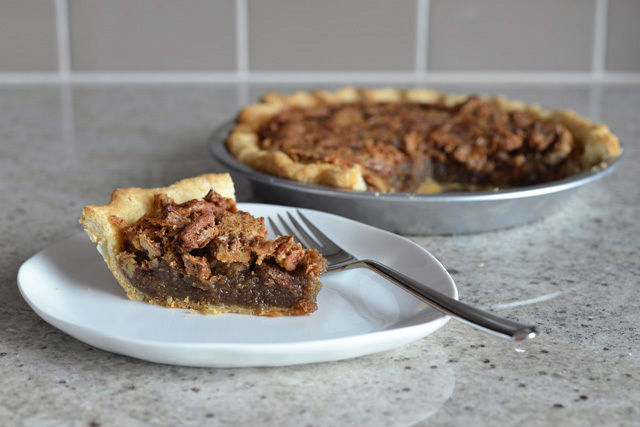 Note: You only need half of this recipe for the Bourbon Pecan Pie, so save the other half of dough in your freezer for another day. In a food processor, pulse the flour, sugar, and salt to combine. Add the cold butter, and pulse until the mixture resembles cornmeal with some larger pea-sized pieces of butter throughout. Drizzle 1/4 cup of ice water over the mixture and pulse until the dough just starts to come together. You should be able to pinch off a piece and have it stay together. If it’s too dry or crumbly, add an additional tablespoon of ice water at a time (up to a 1/4 cup or 4 tablespoons). Divide the dough in half. Place each half on a piece of plastic wrap and use the plastic wrap to form each half of dough into a ball and then flatten them to form about 1/2-inch thick disks, using a rolling pin in needed. Refrigerate the plastic wrapped disks of dough for at least 1 hour or up to a day. Alternately you can freeze the dough for up to 3 months. Makes enough dough for 2 9-inch single crusted pies or tarts, 1 9-inch double crusted pie, or 10 4-inch mini tarts. 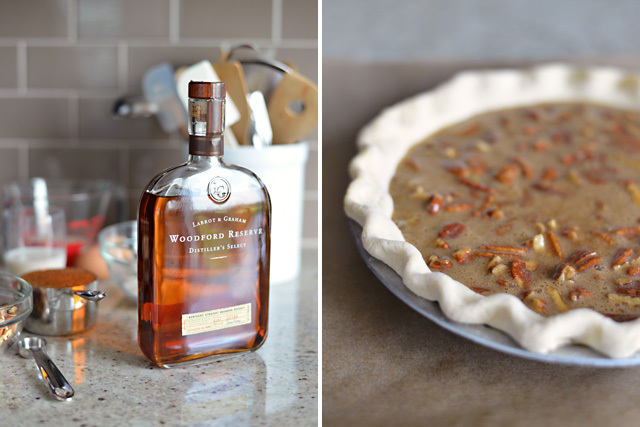 I love love LOVE pecan pie but I’ve never made it with bourbon in. This needs to be remedied now as your pie looks divine :-) I reckon a slice of this would make anyone fall in love all over again! Welcome home Connie! Glad to hear that you and Andrew had a great trip. 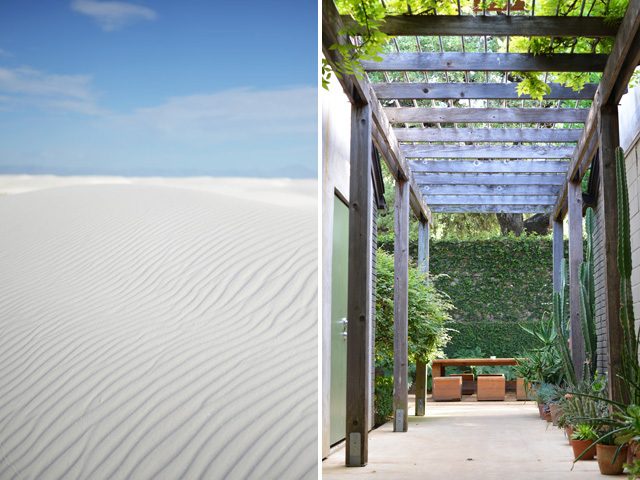 The photos look wonderful as always (I’m especially loving that shot of the Marfa tank). Now, this pie just look dee-lish! We don’t have a lot of bourbon based desserts here in Sydney, but I think this is one that Scotty would love so I’ll have to give it a go! gorgeous as always. Thanks Amanda! This was my first time baking with bourbon and it definitely won’t be my last. Also, in my experience, men, bourbon, and pie go really well together, so I suspect that Scotty would like this as much as Andrew did. 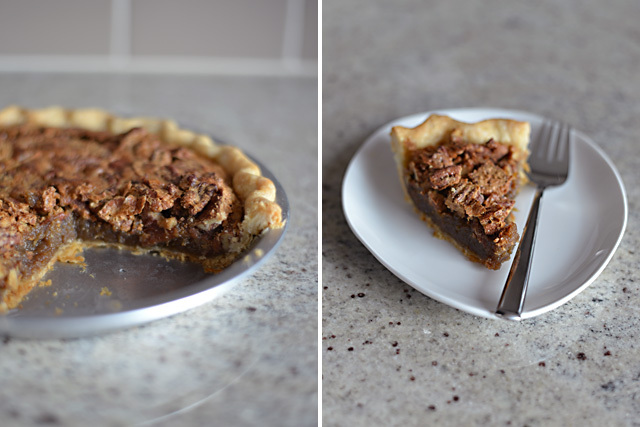 I’ve only had pecan pie a handful of times, but it never does disappoint. I think the bourbon is a great touch and it looks absolutely divine! This pie looks amazing! I think I am going to make it for Thanksgiving next week. I was wondering why you put the pie on a parchment lined baking sheet? Can you not just put the pie tin in the oven to bake on it’s own? Thanks for the great recipe! Hi Allie, This pie would be perfect for Thanksgiving! The baking sheet is a precaution just in case the pie bubbles over. It’s not necessary and it’s just me being overly cautious. I had a pumpkin pie overflow in my oven last year (it was a mess to say the least) and since then I like to bake my pies on a baking sheet. Totally up to you! Thank you for this recipe and I truly appreciate that it does not use corn syrup! I made this for Thanksgiving yesterday and everyone raved about it and asked for the recipe….even those who are not typically pecan pie fans. This will definitely be a recipe that will continue to be made for years to come, thanks to you.